In 12-inch skillet, heat oil over medium-high heat until hot. Add chicken; cook 4 to 5 minutes or until browned, turning once. Remove chicken from skillet; cover to keep warm. Add onion to skillet; cook and stir 3 to 4 minutes or until tender. Add rice, cumin and saffron; stir to mix well. Stir in broth and salsa. Heat to boiling; cook 5 minutes. Return chicken to skillet. Reduce heat; cover and simmer 15 minutes. Stir in bell pepper and peas; cook about 5 minutes longer or until liquid is absorbed, chicken is fork-tender and juice is clear when center of thickest part is cut (170°F). The rice in this casserole is flavored and colored with saffron. Considered to be the world's most expensive spice, saffron "threads" are dried stigmas of a crocus that grows in Europe and Asia. 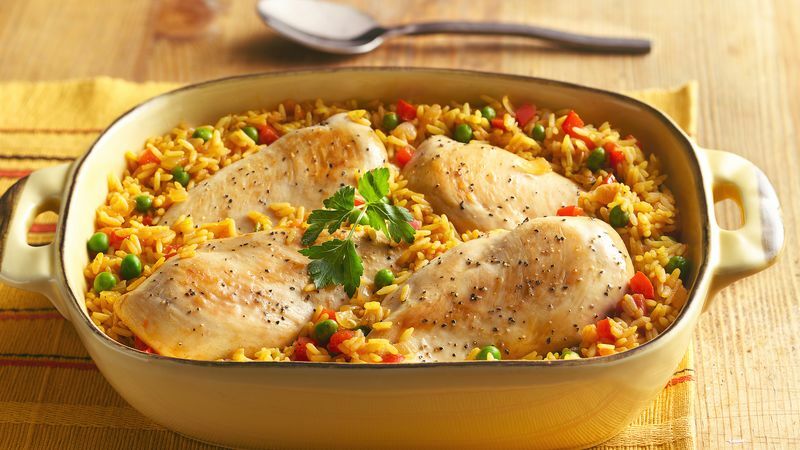 Arroz con pollo is Spanish for "rice with chicken."